Hajebi, G., Tavakoli Ardakani, M., Salamzadeh, J., Barzin, A. (2013). A Survey on Total Parenteral Nutrition (TPN) in the Intensive Care Unit (ICU) of a Teaching Hospital in Iran. Iranian Journal of Pharmaceutical Sciences, 9(3), 37-44. G Hajebi; M Tavakoli Ardakani; J Salamzadeh; A Barzin. "A Survey on Total Parenteral Nutrition (TPN) in the Intensive Care Unit (ICU) of a Teaching Hospital in Iran". 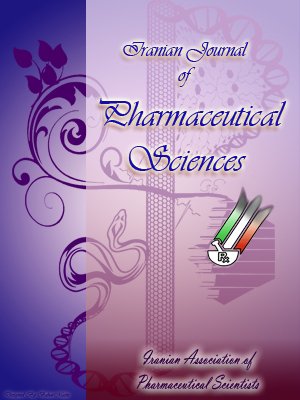 Iranian Journal of Pharmaceutical Sciences, 9, 3, 2013, 37-44. Hajebi, G., Tavakoli Ardakani, M., Salamzadeh, J., Barzin, A. (2013). 'A Survey on Total Parenteral Nutrition (TPN) in the Intensive Care Unit (ICU) of a Teaching Hospital in Iran', Iranian Journal of Pharmaceutical Sciences, 9(3), pp. 37-44. Hajebi, G., Tavakoli Ardakani, M., Salamzadeh, J., Barzin, A. A Survey on Total Parenteral Nutrition (TPN) in the Intensive Care Unit (ICU) of a Teaching Hospital in Iran. Iranian Journal of Pharmaceutical Sciences, 2013; 9(3): 37-44. 1School of Pharmacy, Pharmaceutical Research Center Shahid Beheshti University of Medical sciences, Tehran, Iran. Total parenteral nutrition (TPN) has a vital role in controlling nutritional deficiencies especially in patients with critical conditions who are confined to bed in Intensive Care Unit (ICU). Complete evaluation of the nutritional status of these patients is necessary to achieve their nutritional goal. The aim of this investigation was to study the Complete Blood Count (CBC), coagulation parameters, renal function and electrolyte status of patients hospitalized in ICU of a teaching hospital in Iran. A retrospective study was designed in which adult patients hospitalized in the ICU of Ayatollah Taleghani general hospital in Tehran, Iran, during March 2006 to September 2008, were enrolled in the study. The medical records of 203 patients admitted in the ICU were reviewed. 22 (10.8%) patients had received TPN. Hospitalization days were 12±8 (mean±SD) and the days of TPN were 8±6 ( mean±SD). CBC results, coagulation parameters, renal function tests, electrolyte status, mortality rate and duration of hospitalization of patients were extracted from their hospital records. Data relevant to baseline (before starting TPN), 1st, 2nd and the last day of TPN was analyzed/compared by Statistical Package for Social Sciences software (SPSS, version 19.0). CBC and coagulation status did not significantly change during TPN. Serum sodium did not also change significantly during TPN, however serum potassium in the last day (4.71±1.44 mg/dl) was higher than the 1st day (3.77±1.04 mg/dl), (P=0.02), and 2nd day (3.84±0.81 mg/dl), (P=0.04), of TPN. Not surprisingly, Blood Urea Nitrogen (BUN) in the last day (58.00±35.90 mg/dl) was more than the baseline (32.27±22.59 mg/dl), the 1st day (34.50±21.40 mg/dl) (p<0.01) and the 2nd day after starting TPN (36.55±19.80 mg/dl), (P=0.04).Our results showed that TPN in ICU patients can be associated with changes in potassium and BUN levels. However, further studies with higher sample size are required leading to more comprehensive Conclusion.